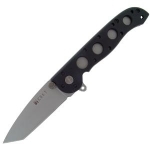 I have the pleasure to exchange emails with James Williams himself and for those in urban area, who needs an extreme light and practical knife, CRKT HEIHO (mine is 1st gen called HISSATSU II) is the choice. As James Williams told me, it is a gentlemen knife. But a knife is a knife, and as a knife, it serves to a large range of utilities. To me, self defense is the use. Here in Brazil, there is no laws to avoid use and carry of any kind of blades. 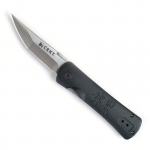 As I am sales manager and have trained knife fighting for more than five years, I have choose this knife because it fits well in business suit, and is fast like a lightining bolt to open, cuts like a laser and is small enough to conceal in any place. 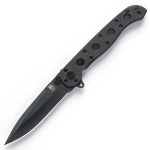 This knife is a tactical advantage in defense situations because its traditional tanto blade (not american style) is a needle to stab and AUS-8 is one of the best cuting steels in this world. So you can bet on this knife. Curiosity: in its handle is possible to read BING FA (Law of War). I got this knife as a present. So far I'm extremely impressed. G-10 handle inlays are very unique. Deep profile pocket clip is great. The knife itself is very sharp.